When I started this blog [two years ago] I had some Hanimex slide viewers [see post, way, way below.] I love slide viewers because my father was a photographer and lots of my childhood – and indeed other people’s childhoods and landscapes and tourist shots- were recorded on slides. We’d have slide nights at home where slide after slide was projected onto a white wall, accompanied by beer and chips. What larks! Ok, back to my point. 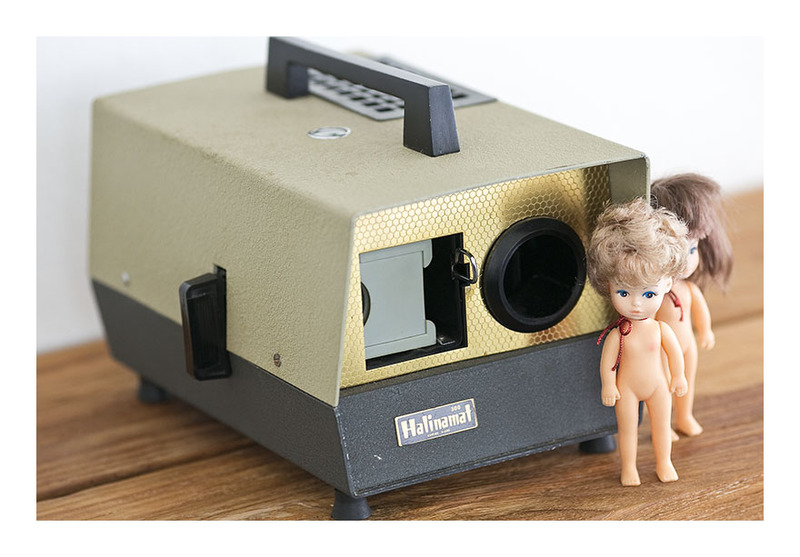 Since I started this blog – with the intention of showcasing my collection and trying to sell some of it- I have had to- HAD to – buy slide projectors. They just came to me. I am a slide projector MAGNET. I now have ten. In perfect, slide-projecting, order. This is number six. Isn’t she a beauty? Lens: f=2.8/ 85mm. Lamp: 300 W, BA 15S short envelope lamp; still available today. 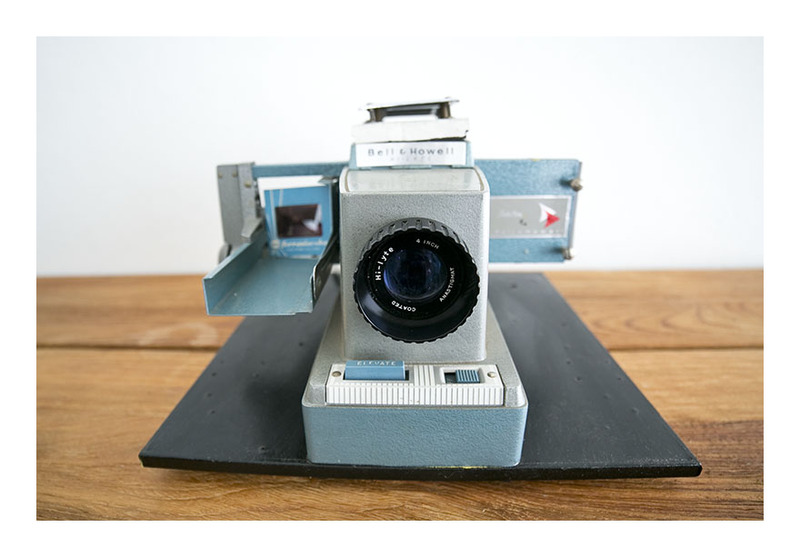 Even if you never intend to use the projector it looks great as a display piece- with a fantastic 60s modernist vibe. And for some reason, like all my other projectors, it comes with a Kodachrome slide from its last owners. Two fantastic Canon camers: The Canonet QL17 [QL = Quick Load] was in its day the best selling fixed lens range finder ever made. It comes with its original manual, and is in full working condition. 35mm film is available, as are processing facilities. 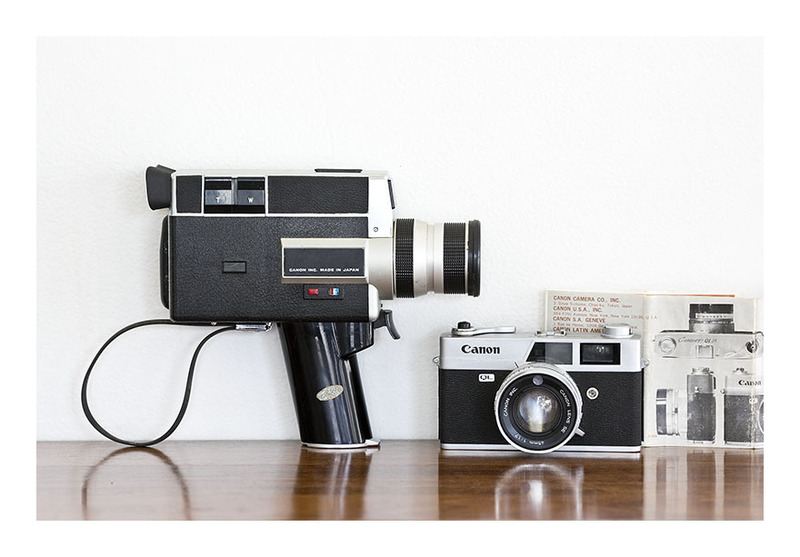 Meanwhile, the Canon 518 Super 8 camera, comes with its original case, and has been tested as working with batteries. Super 8 film is available: see http://www.dvdinfinity.come.au/super_8.htm; and the manual is available online as a pdf. Two superb cameras- in full working order: use for actual photography or pose as I have: gotta love that image of a photographic image! Looking like a cross between a space ship and a mix master- this slide projector is the quintessential expression of 60s machine engineering. 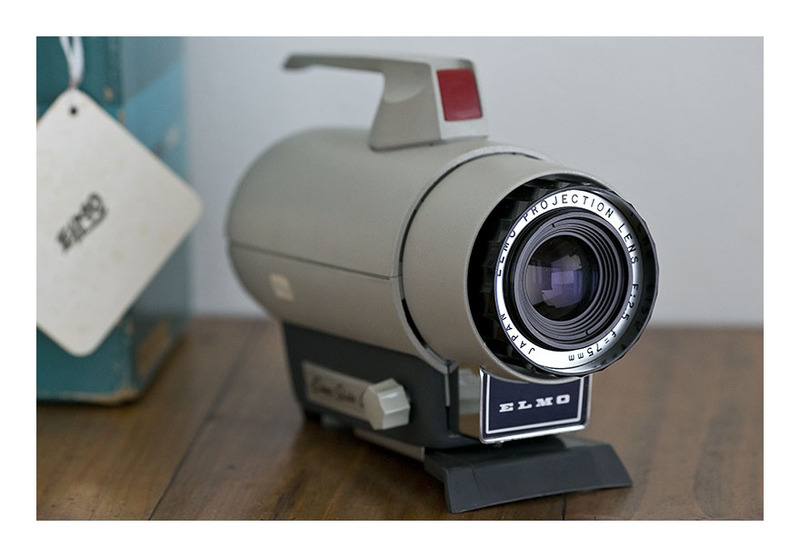 Elmo- or the ‘Electricity Light Machine Organisation’ [a very futuristic name, especially when said in a robotic voice] was founded in 1921 and made its first projector in 1936. They are still in production today. This slide projector is pristine- it comes in a plastic case and its original box, has a working bulb and has been tested and tagged. It has a bakelite switch and plug [adding considerably to its charm] – and a single feed slide changer. The body of the projector slides open to accept the slide changer- it’s quite simply beautifully engineered and made. Looking like a cross between a space ship and a mix-master- this slide projector is the quintessential expression of 60s machinery. Elmo-the ‘Electricity Light Machine Organisation’ [a very futuristic name, especially when said in a robotic voice] was founded in 1921 and made its first projector in 1936. They are still in production today. 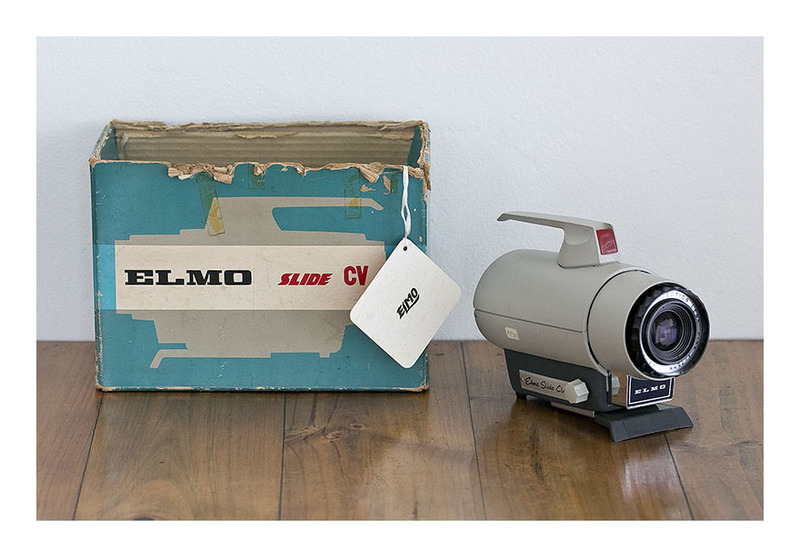 This projector sold for £32.10 back in 1965 [I have the original warranty card and receipt.] And that was a whole lot of money. The projector works like a charm- and the 300 watt lamp it takes is still available. The 16mm lens is astigmat coated- and it’s a’ hi-style’ lens [presumably that’s where the hi-lyte comes from?] 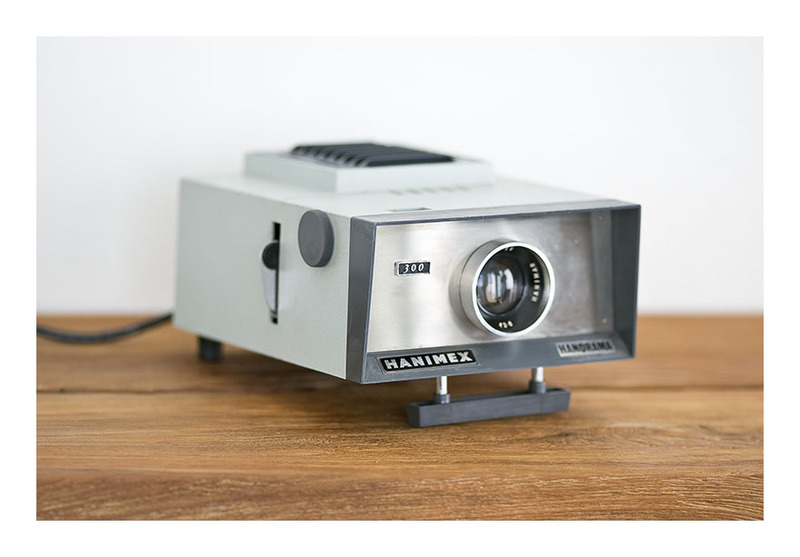 The projector has a cast metal construction and comes with its original manual. Fun for the whole family! Get those slides out of hibernation and have a slide night. If you don’t have any slides, I have a whole lot- you can have a vicarious vacation! 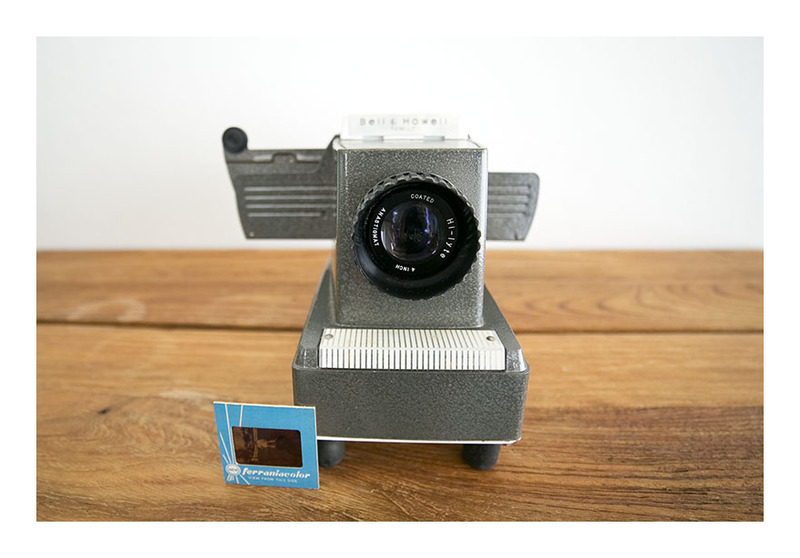 This has to be my last slide projector [6 posted thus far] – I have to learn to pass a projector and not purchase it. I need a 10-step program! 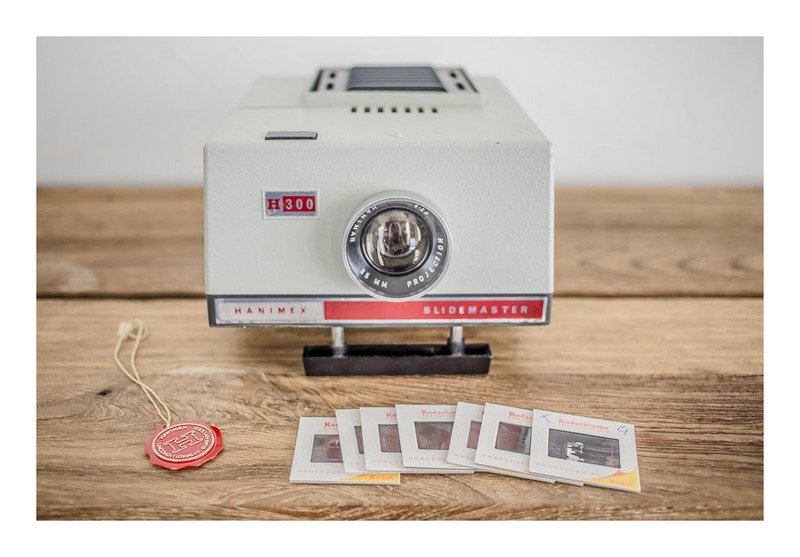 This lovely, boxy projector comes with its original warranty card – which notes that it was purchased in March 1971- and its original box. It also has the funky Hanimex ‘seal’ seen in the image, which boasts ‘Hanimex Unconditionally Guaranteed.’ It has been tested by an electrician the fan and globe are functioning perfectly. The projector’s body is injection moulded plastic and sheet steel. It takes a 300W halogen bulb, and has three separate lenses. They knew how to build ‘em in the 70s! Together with the funky font labels, this projector is as lovely to look at as it is functional. And yes! It comes with some Ektachrome slides from the last owner. And still the slide projectors come to me! 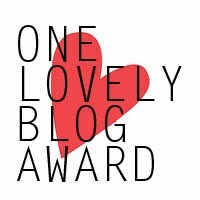 This is the fifth one on the blog, and there are maybe a couple more still waiting to be photographed and posted. I can’t help myself…slide projectors are endlessly fascinating to me. The ‘Family’ comes with a couple of random Ektachrome slides, which will duly passed onto the next owner. The machine has a manual slide-changer [automatic slide-changers didn’t come in until the 70s] which makes the whole slide-night experience especially retro! When I started this blog [five months ago] I had some Hanimex slide viewers [see post, way, way below.] I love slide viewers because my father was a photographer and lots of my childhood – and indeed other people’s childhoods and landscapes and tourist shots- were recorded on slides. We’d have slide nights at home where slide after slide was projected onto a white wall, accompanied by beer and chips. What larks! Ok, back to my point. Since I started this blog – with the intention of showcasing my collection and trying to sell some of it- I have had to- HAD to – buy slide projectors. They just came to me. I am a slide projector MAGNET. I now have four. In perfect, slide-projecting, order. This is the fourth. Isn’t she a beauty? Lens: f=2.8/ 85mm. Lamp: 300 W, BA 15S short envelope lamp; still available today.